"Studying the acoustic responses measured has also allowed conclusions to be made about what kind of sound field leads to a specific kind of observation by listeners. This translates into a better understanding of what kind of architecture supports music best and, above all, conveys the orchestra’s performance of the music to the audience in the best possible way." Professor Lokki’s research team at Aalto University has developed a unique method for recording the acoustics of a concert hall. At the core of this invention are anechoic recordings and a ‘loudspeaker orchestra’ (image). Together, they form a calibrated symphony orchestra simulator where the locations and directional patterns of the loudspeakers are carefully selected to emulate the various instrument groups of an orchestra as placed on stage. The acoustic response of the hall is measured separately at each loudspeaker using a microphone array shown here, with six high-quality spherical microphones. These measurements allow the acoustic response to be recorded so that the sound received at the measurement point can be analysed into components arriving from various directions. These data are used to distribute the acoustic response to a multichannel system in the lab for listening (24 to 40 loudspeakers surrounding the listener, depending on the lab). In sound technology, a similar method is known as convolution reverb, but the Aalto University method is more sophisticated than any available commercial products, as it allows identification and reproduction of the direction from which reflections and echoes come. The loudspeaker orchestra relies on anechoic recordings. Each instrument of the symphony orchestra was recorded, one at a time, in an anechoic chamber, playing extracts of a few minutes each from four symphonic works by Mozart, Beethoven, Bruckner and Mahler. The professional musicians making the recordings played their parts by watching a video of a conductor conducting while listening on earphones to a guide track played by a rehearsal pianist. These ensured that they were playing at the right tempo and in tune. The final soundtrack was formed by combining the acoustic response, measured using the loudspeaker orchestra in the hall, with the anechoic recordings. While at first glance it would seem that the same result could be achieved simply by recording the loudspeaker orchestra playing in the concert hall, the spatial sound can be reproduced more accurately and with better quality with the technique developed. 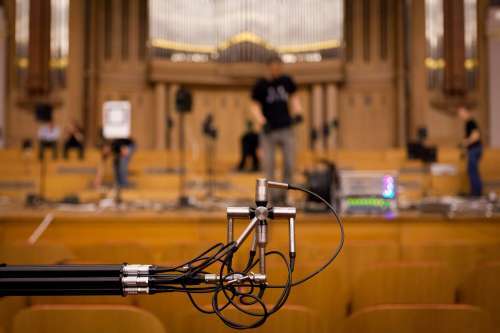 The loudspeaker orchestra produces exactly the same orchestral sound calibrated in exactly the same way in whichever hall is measured, and thus it is possible to compare concert halls in the lab using identical musical performances. The comparison eliminates variation in the performance and is extremely precise, and sensory evaluation methods allow test subjects to describe the differences between concert halls in their own terms. The method also allows the researchers to explore which halls the test subjects like the best and why. These listening tests have led to a quite comprehensive understanding of which properties in concert hall acoustics are those to which listeners pay attention. Studying the acoustic responses measured has also allowed conclusions to be made about what kind of sound field leads to a specific kind of observation by listeners. This translates into a better understanding of what kind of architecture supports music best and, above all, conveys the orchestra’s performance of the music to the audience in the best possible way. The loudspeaker orchestra produces exactly the same orchestral sound calibrated in exactly the same way in whichever hall is measured, and thus it is possible to compare concert halls in the lab using identical musical performances. The comparison eliminates variation in the performance and is extremely precise, and sensory evaluation methods allow test subjects to describe the differences between concert halls accurately. This also allows the researchers to explore which halls the test subjects like the best and why. These listening tests have led to a quite comprehensive understanding of which properties in concert hall acoustics are those to which listeners pay attention.